This material was taken from old annuals and historical records of the Chilocco School. There is no infringement of copyright because there is no entity existing to defend a copyright at this time. 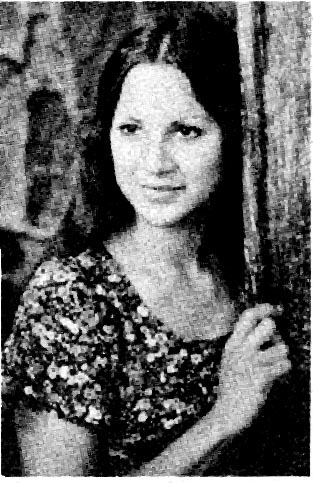 Chilocco is no long functioning since 1980. These old records have been handed to me by family members who had parents and grandparents that saved their annuals. There is no agreement or disagreement on the part of the compiler, Donna Flood, but merely a recording of history. This is the month of January 1881. A wagon train is rumbling slowly across the plains of Oklahoma. For four long weeks it has held to its course which runs to the northeast. Closer examination reveals the occupants are weary and travel worn and more than a little frightened as they realize the journey is drawing to a close. These occupants are Kiowa and Comanche Indian children who are on their way to Chilocco, the newly established Government boarding school. Their irresponsible, carefree days are done and they are among the first group which is to receive an education at government expense. 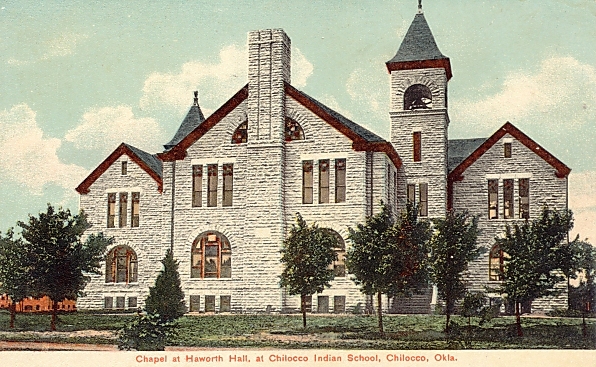 On May 17, 1882, the United States congress passed a bill, known as the Indian Appropriation Act, whereby a sum of money was to be appropriated for the building of a school for Indian youth. The secretary of the Interior then authorized the construction of a building which would be adequate to care for 150 children. That same year James M. Haworth, Superintendent of Indian Education, was sent to investigate the possibility and advisability of such a plan. 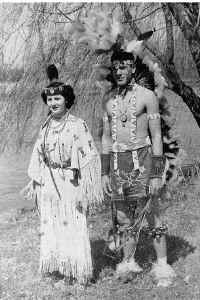 The first tract of land which he took under consideration was located near where Ponca City now stands. This land was rejected, however, as it was found to be unsuitable. The site which was eventually selected consisted of 1191.06 acres which bordered on the Kansas state line. Haworth then made his report to Washington and upon receiving orders soon had men at work on the project. A quarry of magnesium limestone was located and stone cutters began the task of shaping stone for the building. since it had been decided that the best and most economical way of launching this project was to place all departments under one roof. This was the then gigantic structure which soon began to rear its form to the sky. By January 1883, it was pronounced completed. It was ready for occupancy. Cowboys and Indian who rode by gazed at the huge three storied building with wonder mixed with awe. It is quite easy to understand why children who had lived in small cabins and teepees should be frightened at the prospect of leaving their homes and parents to live in such a large building around which the cold north wind so mournfully howled. The building was called Home two and it was used to house the small boys. Jasper M. Hadley had received his appointment as the first superintendent of the new school and was there to welcome the little homesick waifs who soon began to feel very much at home in the building which housed all the students, all the employees, and all the activities pertaining to the school. It was soon decided that since the boys were to be taught how to farm, more land was needed. Accordingly, on July 12, 1884, the president issued an order whereby the tract was increased to 8640 acres. In 1886, the Cherokees had deeded a portion of their outlet to the government for school purposes. it is not presently known whether the school occupies that land. The children fell readily if awkwardly into the scheme of work which consisted only of the traditional three R's and the rudiments of such vocational training as farming, black smithing and simple leather work. In a short time it was found that the school was too small to accommodate adequately the dozen of children who were clamoring for admission. Accordingly, other buildings were erected. Year after year the school has been enlarged until at the present time, November 1932, there are some nine hundred children adequately cared for in the six large dormitories. still many are turned away each year for lack of accommodations. In 1894, ten years after the establishments of the school, the first class consisting of six boys and nine girls, marched proudly up to receive their diplomas for a work well done. While the academic department has been moving onward and upward the vocational departments have been making equally rapid progress. While the children had been receiving very valuable instruction in vocations all through the years it was not until 1932 that a truly vocational school was organized. Over -aged children who find the regular academic work tedious or difficult are now classified in the vocational school where they are taught a means of livelihood and are given diplomas at the end of the course. All students attending Chilocco are allowed to select vocations tentatively while in the junior high school but they cannot make their decisions final until they enter the senior high school. All are required to choose and learn a vocation before graduating. Each year hundreds of car loads of people leave the highway and ride down the beautiful tree bordered drive to visit the school and view the attractive campus which is one of the show places of this section of Oklahoma. Without exception they are visibly impressed with the opportunities offered to, and the courtesy and graciousness shown by the student body. However, it takes the real old timers to remember that at one time the pleasant tree shaded campus which is surrounded by so many beautiful vine covered buildings, was once only a sun baked prairie where stood just one tall, bleak building, upon which the heat of the summer sun beat mercilessly down, or around which the winter wind howled dismally as it did when that first group of lonesome, frightened little Indian boys and girls came to Chilocco. 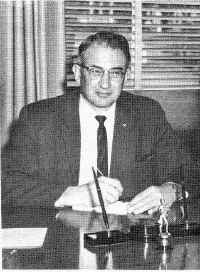 Mr. Ernest C Mueller was the principal at the year of 1953 when I first entered the Indian School of Chilocco. My first memory of him was when my mother and I were sitting in his office. There was something deep and strong about the man. He had all my paper work in his hand while he seemed to dismiss all the incoming responsibilities while he spoke directly to me. "We are offering you an opportunity. Our school is under the guidelines of the federal government and these are the people to whom we answer, not state, not local authorities but to our country of the United States of America. Work hard, be a good student, stay out of trouble and you will do well as I am sure, from looking at your grades, you will do." You are to be congratulated for having completed the requirements for high school graduation and so it is with sincerity and appreciation that I offer you these congratulatory greetings. Sincerity, because I realize that you are due a great deal of praise. You have come a long way on the road to successful living. No boy or girl could have accomplished what you have without having developed within his inner-self a determination to accomplish a definite purpose in life. Appreciation, because it has been a genuine pleasure for me to work with you during the four years that you have been at Chilocco. You came to Chilocco as a high school freshman and during the days and years that you have been here, you have not only grown and developed physically but you have also developed socially, morally and spiritually. You have developed mental attitudes and aptitude skills. As your school principal, I take pride in you as a product of this school. Like any school, honors were given to students who were willing to live by the rules and work toward their own achievements. The Princess and Brave honor was given to someone who had been active in the Indian Club. They were supervised by learned people as to the particular tribe and the appropriate costume of that tribe. Today, many people are mixing regalia. However, at this time, 1952 there was still an adherence to the conservative nature of the American Indian. This boys costume is marked on his breechcloth with the symbols of the woodland, flowers and herbs which tells he is of the woodland plains tribes. He wears a fancy dancer regalia. Symbols on the beadwork around his neck is of the mountain design, also telling of a coming out of the mountains (maybe) to the plains area. He wears no roach which says he is not Osage or if he is, he hasn't been named yet, which still could be a possibility because he holds a whip in his hand saying he is a "whip man." This person's duty is to "whip" the dancers who sit out too long during the ceremonies. They don't literally whip anyone, just drag the leather thongs over their legs to remind them they are sitting out too long. Barely visible to the back of his legs is the broadcloth strip of fabric. This company prides itself in the fact that the basic design, that of dark navy blue woven wool trimmed in a narrow edge of color has not changed in over 200 years. The girl is very fair and probably doesn't know her traditions as well. 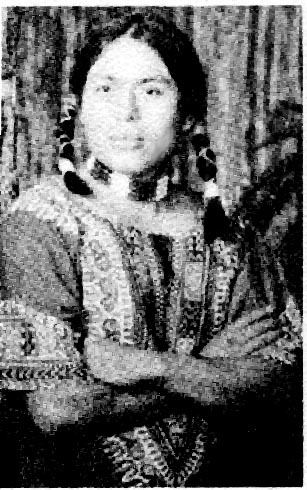 She wears a northern buckskin dress. However, the belt she wears looks to be store bought rather than a finger woven wool fiber belt. She has an expensive beaded head dress, but she wears an eagle feather instead of the tradition plume of the plains maidens. At her neck should be a necklace telling whether she is maiden, mother, or grandmother. Three medallions for a maiden, two for a mother, one for a grandmother. She is not carrying the customary shawl on her arm, neither does she hold a fan in her hand. One clan of the Poncas has the right to wear the buckskin dress, and I'd be willing to wager she is not of that clan. At this time, 1952, all these traditions were strictly carried out. Today is different. There is a blending and sometimes it is difficult to tell just what is tribe of the person. The clan is even more obscure and is not marked with strength on their dress. Probably, because our clans have become blended and are not required to be followed as to their archaic laws and principles. There wasn't a campus anywhere that was as beautiful as the Chilocco campus and as we strolled past the fountain located in the center of the oval we were watching Mrs. Hayman as she drove around that circle. "She's your mom!" my friend told me and I had to smile, because, indeed, I spent as much time with her as I would have spent with my mother. 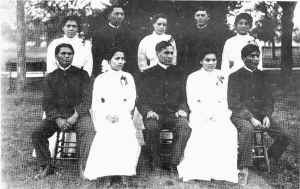 It was just the way of the students to joke with one another about their lives there at the boarding school known as Chilocco Indian School. 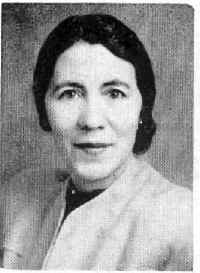 Miss Vivian Hoage became Mrs. Claude Hayman, as she began teaching at Chilocco, grew up teaching there and married Mr. Hayman when his first wife died. Mrs. Hayman was the journalism teacher and as was the schedule I was assigned to her as her "girl," to carry notes, sharpen pencils, edit, write, proofread a big part of the school weekly newspaper, The Indian School Journal and whatever other duties I performed in order to be given my vocational training for one half a day. Mrs. Hayman's classroom looked out over the lake where the green lawn just lay in a flat almost non-existent slope toward the water. The white bobbing geese kept their activities up and down the waters and were there for the pleasure of the students to observe. Life was kind, easy, with nothing what so ever to interrupt the peacefulness of it. "If Mrs. Hayman is my Mom, Flodelle is yours!" and her friend had to laugh equally as much as she had a moment earlier. Flodelle Dyer was the choir teacher. The children, away from her hearing, quietly spoke of her as Flodelle. She was not a young woman but it was a fact she would forever look like a youthful person with high clicking heels, fashionable clothes, and, oh the music, to make anyone a dreamer. She hammered out the scales and arpeggios early each morning at choir practice, seven a.m. while in their youthful zest for life the music was sheer magic. There was music from stage shows of Roger and Hammerstein, Oklahoma, spirituals, light folk music, and whatever struck the fancy of the quick, hard working lady. To say she was partial to any student was not a fact. She equally spread the music around to who so ever wished to participate. All one had to do was have the willingness to take a solo, an octet, or an operetta and the part was handed out. She created memories never to be forgotten. The Spanish dancers in the operetta, the pageant while exercise clubs swung in unison, painted with reflective light and spot lighted with black light to The Merry Widow Waltz, or the haunting voice of a talented soprano as she sang a popular love song, all were memories to be held in heart and mind, forever. 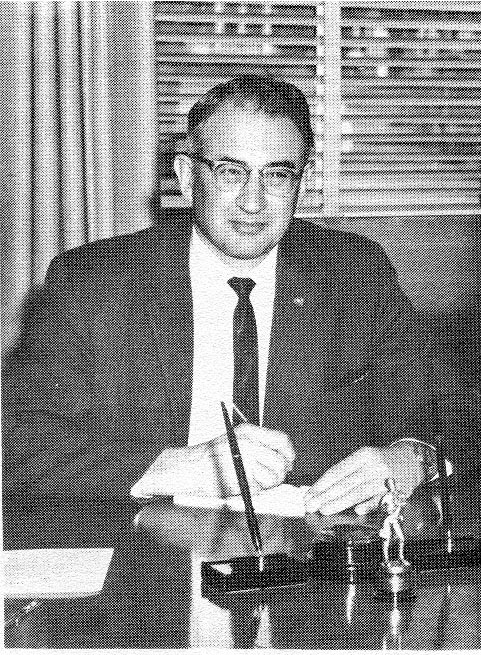 Dr. Leon Wall, was named superintendent of the Chilocco Indian School August, 1962. In acquiring this new position, he became the 13th superintendent at Chilocco since the school opened in 1884. 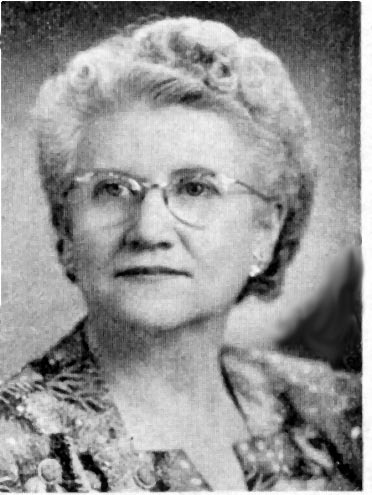 Prior to this time he served six and one-half years as principal at Chilocco and also was a teacher, educational specialist, and principal in the states of Nevada, Arizona and North Dakota. Dr. Wall brought to his new position six years of teaching in state schools and twenty-three years of service with the Bureau of Indian Affairs. He is a veteran of world War II and served in the American, European and Asiatic theaters. His formal education consists of a bachelor's degree from the University of Oklahoma, a master's degree from the University of Nevada, and a doctor of education degree from Oklahoma State University. One of Dr. Wall's accomplishments, worthy of mention, is the fact that he was the author of a 10,000 word Navajo language dictionary which is used extensively in the field of education. 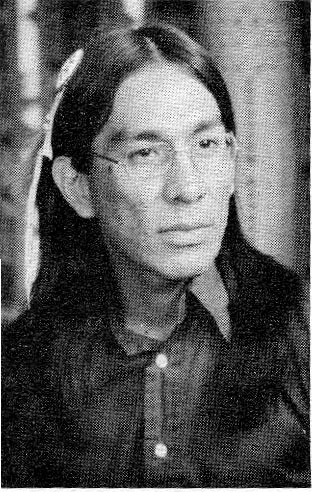 He has also aided in developing techniques which may be effectively used in teaching English to Navajo children. I had the honor and privilege of serving as Dr. Wall's secretary for a short appointment while his regular girl was on maternity leave. The year I worked with him gave me a wealth and depth of understanding and appreciation for these gentle educators who sacrificed everything to work and give to the Native American children at Chilocco and in Dr. Wall's position not only at Chilocco but other schools as well. He had a love for Navajo people and the short association I had with one of them gave Dr. Wall and I a mutual respect for the tribe. Dr. Wall who was patient and respectful of the many folks he was serving and with whom he worked. He was a tall giant of a man but his quiet and always pleasant ways made him approachable. I feel I helped him through a transition period when he first accepted his position at Chilocco since I was acquainted with the staff and the system there. I was very young just out of a couple of years of college and he gave me a very good feeling about myself as to my being able to know names and procedures, up to a point, and with my lending this knowledge to him. Such questions, "Mrs. so-and-so called me, now who is she and what department is she over?" was just a minor problem but it made for a smoother work day for him to have access to my being able to provide these small details. To teach him how to operate the archaic printing press type machine for the many bulletins which were part of the paper work of the government was really not a small thing, since the contraption had at least twenty steps to follow in precise order before it would function. I had worked in the office during my school years there and learned the temperamental machine's ways, and was one of the few people who could operate it. He was not too lofty in his position to humble himself to meekly learning its ways, and with trial and error, just as everyone would have to do. It was a small joy to see him finally, skillfully turning out the great amounts of copies necessary for this or that report. "To our beloved superintendent and good friend, Mr. L.E. Correll we bestow this very high honor. Mr. Correll has been at Chilocco since August 15, 1919. The next day after he received his Bachelor of Science degree at A.& M College in Stillwater, Oklahoma, he was appointed to the position of instructor of agriculture, a position he kept until he became director of agriculture in 1924. 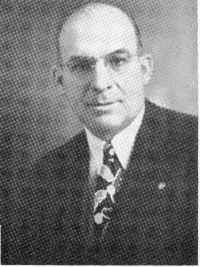 It was the spring of 1925 when Mr. Correll received his Master of Science degree at Oklahoma A&M . 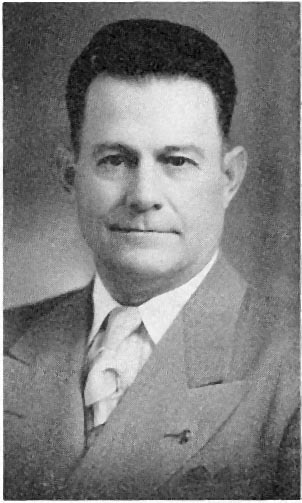 From July 1, 1926 until this present time, 1952, he has been superintendent at Chilocco. His words: "During the time you have been at Chilocco, the faculty of this school has given you the essential vocational training to enable you to go out and earn a respectable livelihood; in addition we have given you the traditional academic training usually offered in a high school. Your little class annual, The Chiloccoan, will give you a written as well as a pictorial history of your work while a student at Chilocco. Be sure to keep your present memories and acquaintances, active, and fresh in your minds." As the school was closed in 1980 there were many sorrowful, sad, and deep regrets, among the faculty and the students as well. 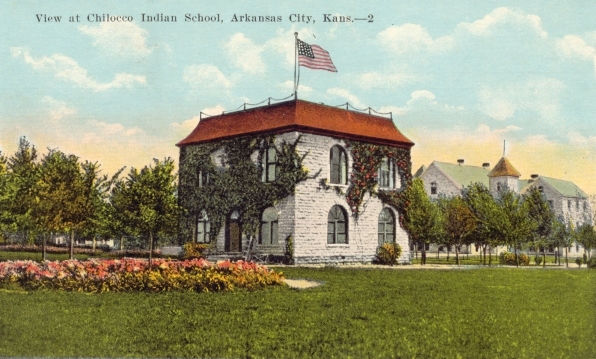 The school had served its purpose, it brought the American Indian into the mainstream of society and with that there was no longer a need for the institution. With Mr. Correll's retirement it gradually began to disintegrate. He was a strong influence on its success as long as he was in charge. He was an astute business man, a strong leader in the total community and kept a good press for the school. While he was there the school was self sufficient and was kept up largely by the functioning of its own society. It was self contained requiring no great drain on the government for moneys. The dairy provided, the orchards, the livestock, chickens, beef, mutton. The labor for the upkeep was provided by the students in whatever vocation they chose to follow. Remember Mr. Correll had his degree in agriculture. Actually the school operated like a minuscule country, totally encapsulated and with its own peaceful government. It was probably true Mr. Correll could maybe have been called the king. However, if that was so; he was a king with a benevolent rule for his subjects, the children of the Native American tribes. Even if there were 1000 students in a year he could call each one of them by name if there happened to be a chance encounter on the lawn or at some social occasion. He, like the other hand picked employees, dedicated their lives to a cause, and it was this cause to set an example of peace, obtained through that dedication and hard work to all who wished to remain, obediently following the sharp military like rules, in what could be remembered as a Utopia for the four years required to obtain their high school education. Some picked up on that order and continued living on there as employees also. The freedom from teachers uneducated in dealing with the racial prejudice, poverty, fear of failure, uncertain living circumstances, unbalanced diets gave the children a great reward for their complying with the sometimes heavy strict rules with five thirty in the morning rising and lights out by nine thirty at night. It was common to see the students with their books on the floor studying through a crack in the door where the hall light came through, if this didn't go on too late and then was corrected by the ever present rounds of the hall monitors. The side effects of the peaceful experiment was the blending of the great numbers of tribes as the students became acquainted and later were actually united in marriages. This had the greatest impact on the strong cultures of the tribes as to a weakening of their definite customs through intermarriage. Whether this was thought out by great minds or just happened will probably never be known. Of course, all rules are made to be broken and this in itself was a challenge which is always joyfully recounted at the alumni meetings up until the students are quite elderly remembering the fun of "getting away" with some infraction. The breaking of a rule usually involved something as innocent as avoiding the hall monitor so as not to necessarily attend some social event in order to study or something else as non-destructive. 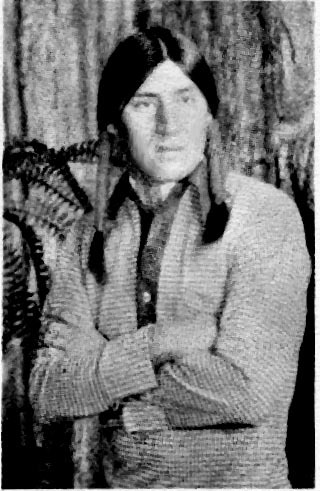 Dennis Michael Jones, brother to Donna, was a student at the school in this year of 1952. He was the president of the Silver Key Club. 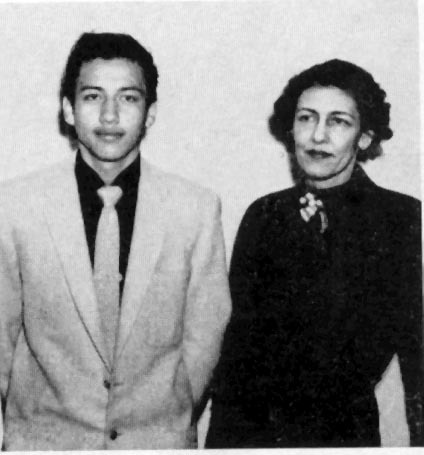 He is pictured here with Miss Kay Ahrnken, English teacher. As a rough estimate these photographs of students are maybe five percent of the total number of tribes to attend Chilocco. In the interest of preserving the memory of a place that to me was truly Camelot I am recording these things from material that has been handed to me over the years from individuals who were passing it on with no intention or goal of any sort in mind. Please do not accept my opinion as the ultimate truth, for every person who was involved has their own story to tell, I'm sure. For myself the experience was altogether pleasant, rewarding and beneficial. My grandmother, Elizabeth Little Cook, Pensoneau, Hernandez was an early day student as well as employee. My mother and uncle were students there in the first annual we are exhibiting. My aunt Otilia Hernandez was there in administration when the school closed, 1980, along with my uncle Francis Hernandez, in the kitchen, and his wife Lucy Rousseau Hernandez, with the canteen. There were all manner of discussions when the school was closed and one can find pro and con statements if they look. In my heart and my memory I will always remember the beauty of the institution and this is how you will see the school through my eyes. For the common person to walk among castles, manicured lawns, orchards, a peaceful lake with geese bobbing there, gentle kind instructors dedicated in their lives to teaching, for those of us who came from simple backgrounds this was to me the grandest and best time of my life. For modern criticism as to teaching subservience, disturbed students, archaic values, isolationism and on and on, truthfully I cannot address these things. As a student and later an employee all I knew was the answer of a call to duty to better oneself, to an aspiration toward higher accomplishments, and the practice of things learned. The hall was named after on of my husband's, Rodney Flood's ancestors, Maj. James Mahlon Haworth. Here are some interesting facts on this man given to me by his grandson Thomas B. McDavitt. James Mahlon Haworth was born in Wilmington, Ohio on November 19, 1831 and died March 12, 1885 in Albuquerque, New Mexico. He and his family relocated from Ohio to Olathe, Kansas in 1870 prior to the July 2 date of the 1870 U.S. Census enumeration. His father, George D. Haworth, was of English extraction and his mother, Edith Hadley, was of Scottish extraction. the first generation to emigrate was George Haworth of Rock Cliff near Bacup, England, who came to America in 1699 with William Penn and lived in Philadelphia a short time. George Haworth, the grandson of George Haworth the immigrant, and the great grandfather of James Mahlon Haworth, accompanied Daniel Boone on one of his first expeditions into Kentucky. Studied at Earlham School, Richmond, Ind., 1848-50; farmer; merchant’ railroad ticket agent; Treasurer, Clinton County, O.; Captain, 40th Regiment Ohio United States Volunteers, 1861-63; Superintendent, Kiowa Indian Agency, 1873-77; Special Indian Agent-at-Large, 1879-80; Indian Inspector, 1880-82; Inspector of Indian Schools, 1882-83; Superintendent, Indian Schools, 1883-85.
b. Wilmington, O., November 19, 1831. d. Albuquerque, N.M., March 12, 1885. s. George D. Haworth and Edith Hadley. 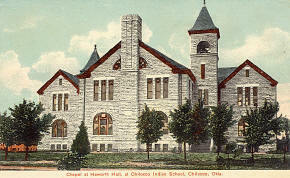 JAMES M. HAWORTH was born in Clinton County, Ohio, November 19, 1831. Is a member by birthright of the Society of Friends (Quakers). Previous to the war, was engaged in farming and merchandising. Was for many years connected with the Clinton County Agricultural Society, filling the position of president in 1861. Was elected County Treasurer in 1856, and re-elected in 1858, holding the office four years and three months, his term closing in September, 1861, when he recruited a company of which he was elected Captain, and going to Camp Chase was assigned to the Fortieth Ohio Infantry, which regiment was ordered to Eastern Kentucky, and became a part of a brigade under command of General James A. Garfield on whose staff he served as A.A.A. General, until the General was ordered to another part of the country. He resigned his captaincy on February 7, 1863 on account of increasing infirmities and returned to his home for restoration. In 1865, he removed to Cincinnati and engaged in the wholesale drygoods business, until 1870, when broken health, requiring a change of climate, he removed to Olathe, Kas., from where, in the fall of 1872, he was appointed United States Indian Agent and placed in charge of the Kiowa and Comanche Indians, near Fort Sill, Indian Territory, remaining there until April 1878. He was one of a commission for locating the Sioux, in the summer of 1878, soon after which he was appointed a special Indian Agent at large, and on February, 1879, was appointed United States Indian Inspector, which position he held until July, 1882, when he was appointed Inspector of Indian Schools, an office created by the session of Congress which had just closed, the duties being of a supervising care of all the Indian schools in the United States, excepting the five nations in the Indian Territory. JAMES M. HAWORTH.--Superintendent of Indian Schools, died suddenly in Albuquerque, New Mexico, March 12th, 1885, in his 53rd year. Funeral services were held at the M. E. Church, Olathe, Kansas, March 16, at 1 o'clock P.M., under the direction of the I.O.O.F. and A.F. & A.M., and were largely attended. The deceased was one of the most highly esteemed men in Johnson county, and his sudden taking off is mourned by all. Arkansas City Traveler, March 18, 1885. This city was startled Friday with intelligence of the death of Maj. J. M. Haworth, which occurred at Albuquerque, New Mexico, Thursday, March 12, 1885. Maj. Haworth has been long and favorably known by many of our citizens. He was a man of exceptionally great ideas, pure motives, and earnestness in the work he was engaged in. He threw his whole soul into it, and made it the sleeping and waking thought and study of his life. Major Haworth has been in the Indian service since 1873, and in that time, no breath of suspicion has ever been raised in regard to his honesty of purpose or administration. In 1873, he was recommended by the Quakers, of which body he is a member, to the Government and was appointed agent of the Kiowas and Commanches, then just located in the Territory, and in a very wild and savage state, not having been subjected in the least to civilizing influences. He remained in charge of them for six or seven years, meeting with most gratifying success in their control. No agent since has been enabled to do so much for them. At the end of the year 1879, he offered his resignation, and was appointed Inspector of the Agencies in the Territory, and in 1882 to General Superintendent of all the Indian Schools in the U. S. In this position, he has labored faithfully and well. It was at his suggestion and influence that the Chilocco Schools were placed where they are, and it was by his untiring and ceaseless labors that so many Indian children are now enabled to receive the benefits of perfect training schools, learning the arts of civilization and the benefits of peace. Major Haworth was contemplating a removal to our city upon his release from his present position, and expected to engage in business. His loss will be greatly felt in this community, whose true friend he had proved himself; and we venture to say that he had more friends here than any other man not a resident. We print below the resolution adopted by the Presbyterian Church of this city and the citizens generally, as they voice our feelings and sentiments. WHEREAS, That while placed in many and severe trials and difficulties, he has so nobly and uprightly conducted himself, both as a government official and a private citizen, that those of us who knew him most intimately, desire to record our appreciation of his kind, generous, christian spirit manifested in motives and deeds that betokened the abiding presence of the almighty with him, and reveals a great, generous heart, whose noblest impulses were enlisted for the elevation and salvation of the Indian race, in whose interests he labored so assiduously. 1st. That we, citizens of Arkansas City, Kansas, and members of the Presbyterian Church, in congregation assembled, while bowing in humble submission to the orderings of His will, who Adoeth all things well,@ record with greatful memory, the life and labors and eminent christian spirit of our departed friend. 2nd. That we are assured this great change means to him nothing less than the fulfillment of a life-long desire to hear the Awill done@ of the master, for which his life, public and private, in business or in social converse, has so eminently filled him. 3rd. That we express our grief and sorrow at the great loss sustained by the government service, and his family, and that we hereby extend to the stricken wife and children, our most heartfelt sympathies in this their great bereavement. 4th. That a copy of these resolutions be forwarded to the President of the U. S.--to the Indian Industrial School at Chilocco--to the family of our brother, and that they be published in the papers of this city. Signed by Committee. J. C. TOPLIFF, S. B. FLEMING. March 15, 1885. Rev. Fleming held memorial services at the Chilocco schools Monday last in honor of Maj. J. M. Haworth. Do sign Donna's Guest Book if you get a chance! 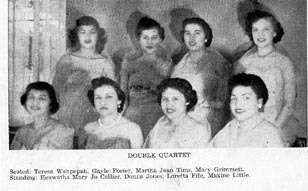 The Oklahoma History Center has a database on CD, of all students who enrolled at Chilocco but did not necessarily graduate. Bureau of Indian Affairs, 101 N. Fifth Street, Muskogee, Ok.
2. Concho, North of El Reno, Ok.
3. Riverside, at Anadarko, Ok.
4. Sequoyah, at Tahlequah, Ok.
5. Carter, Catholic school for Indians at Ardmore, Ok.
6. Pawnee, at Pawnee, Ok.
7. Jones Academy at Hartshorn, Ok.
Material from the collection of Vivian Hogg Hayman was a gift from her and delivered to me by her family after her death. I was deeply touched by their thinking of me and intrusting Mrs. Hayman's collection to me. I felt she had reached out from the past and was once again transported to the wonderful years at Chilocco. She was my mentor when I was assigned to her detail, a girl Friday type job.